The Supreme Court has ruled that the home is entitled to maximum search protection. Even if they have probable cause to believe something illegal is going on inside your home, the 4th Amendment requires police to get a signed search warrant from a judge to legally enter and search your home. The major exception to the search warrant requirement is where consent is given to an officer’s request to enter. If, for example, an officer is legally invited into your home, any illegal items that are out in the open – or in “plain view” — can be seized as evidence, which can lead to an arrest. That being the case, it’s always wise to keep any private items that you don’t want others to see out of view of your entrance area. It’s a good safety habit to determine who is at your door before opening it. If after looking out the window, through your peephole, or asking “Who is it?” you find police at your door, you have several options that may help keep them from unexpectedly entering. 1). If you’re concerned they might try to force an entry, you may greet them outside after exiting through another door. 2). You may speak with officers through the opening protected by your chain lock. 3). If police come to your door and you don’t require their help, you may simply decline to answer the door at all. 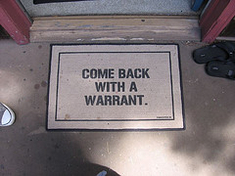 Unless they have a warrant, they will eventually leave. In many cases, an officer’s visit will have little to do with you or be something you can easy fix. For example, an officer may be seeking information about a crime committed in your neighborhood. Or she might be responding to a noise complaint. If so, it’s wise to apologize for the inconvenience, then turn down the music or bring in your barking dog from the backyard. In other instances, an officer might want to investigate activities taking place in your home and ask to enter. You might even be a suspect in a criminal investigation. In such a case you should remain silent — except to say “Officer, I can’t let you inside without a search warrant.” Following such an encounter, you should immediately contact a lawyer before speaking to police again. As is often the case, a naïve friend, family member, or roommate may invite police into your home. They too should be aware of their right to refuse police entry.